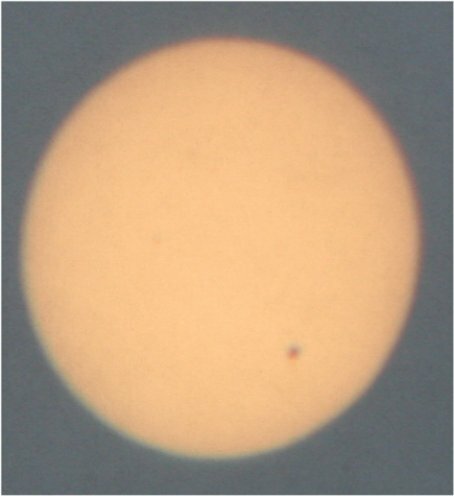 I had the rare opportunity to watch Venus pass in front of the sun yesterday. This is called a transit, and it’s a rare event because the orbit of Venus around the sun is tilted relative to the earth’s orbit around the sun. 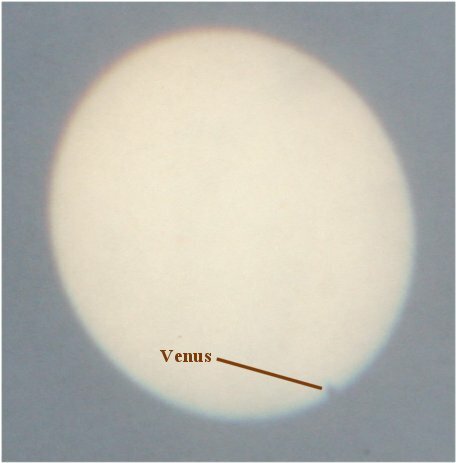 As a result, Venus passes between the earth and the sun frequently, but it rarely passes directly between the two. However, every now and then Venus lines up directly between the earth and the sun twice in a period of eight years. 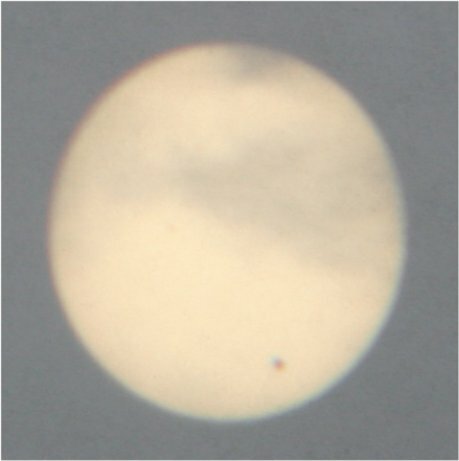 When this happens, you can see Venus as a black dot passing across the face of the sun. It happened in 2004, but the weather in my area was too cloudy to see it. It happened again yesterday, and this time, the weather was a bit better. It wasn’t completely sunny, but there were enough patches in the clouds to actually see something. That’s good, since it won’t happen again until 2117, and I doubt that I will be alive then! As you can see, the binoculars were not made for the tripod, so I used the bungee cord to hold them in place. I used a threaded rod, two nuts, a metal ruler, and tape to hold a screen made from cardboard and white paper behind the binoculars. 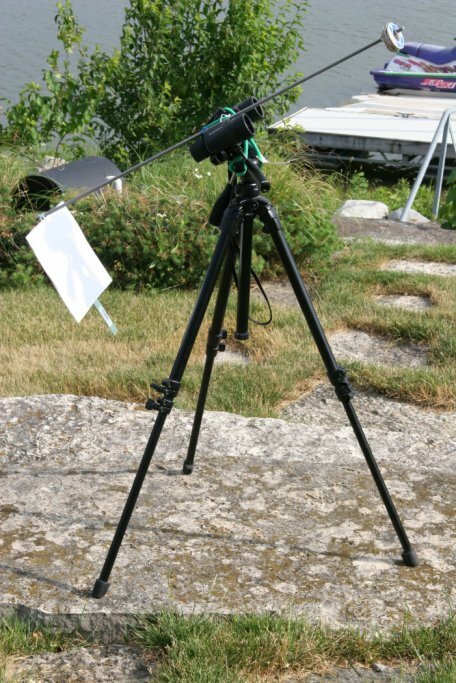 That way, the image of the sun would be projected through the eyepieces and onto the screen. Because the ruler and screen were heavy, I needed a counterweight to keep the threaded rod hanging straight along the angle at which the binoculars were pointed, and the spool of soldering wire worked great for that. Below the fold, you will find some pictures of what I saw. The dark smears you see are cirrus clouds that were passing between me and the sun at the time. 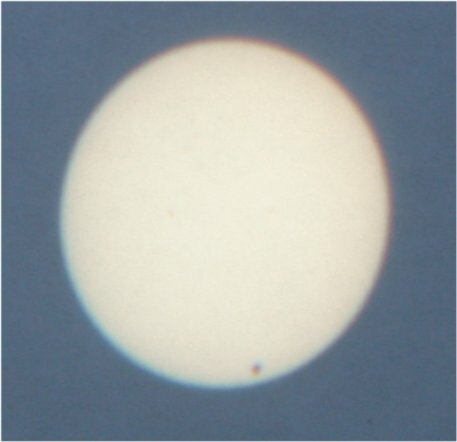 The entire process took about three hours, and as you can see, Venus wasn’t even close to reaching the other edge of the sun. Well done! Awesome pictures and nice setup. Astronomy is one of the many things I’m interested in, but don’t have enough time to pursue. Hopefully, I will have time a bit later on in my life. Thanks for the post! I was fortunate enough to see the 2004 one, though using a filter instead of a projection system. June is the dry season for Zimbabwe so clouds weren’t a problem. I must say that yours is a pretty elaborate arrangement though. I am glad you got to see the 2004 one, Josiah. I didn’t want to buy a filter; I just wanted to use what I had on hand. I guess when you are “jury-rigging” something, it tends to be rather elaborate. It doesn’t seem like to you Rube Goldberg something like this. Did you use your leatherman tool? Shouldn’t duct tape be more prominent? AO, I don’t think my setup comes close to a Rube Goldberg device, and I very rarely use duct tape!